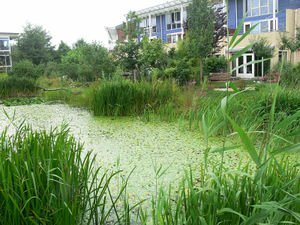 Treatment wetlands are green infrastructure (GI) human-made constructed wetlands for mitigating runoff volume and remediating influents, such as surface runoff. There are several types of constructed treatment wetlands, including free water surface (FWS), horizontal subsurface flow (HSSF), vertical flow (VF), and a floating treatment wetland (FTW). Each of these offers variations in hydrology and macrophytes, providing different strategies to achieve the implemented purpose. Figure 1. Free water surface wetland (Kadlec & Wallace, 2009). Free water surface constructed wetlands (Fig. 1) are open water areas and operate similarly to the natural environment, like marshes. The main type of vegetation is emergent and floating macrophytes. Uses for this type of wetland to remediate waters through redox processes, sedimentation, precipitation of contaminants, adsorption, and filtration. Responds favorably to a great variability in water flow volume. Used in urban catchments in all climates; winter is slightly less effective. Horizontal flow is above root structures. Figure 2. Horizontal subsurface flow wetland (Kadlec & Wallace, 2009). Horizontal subsurface flow wetlands (Fig. 2) allow water to flow horizontally through the plant root zone. More cost effective than other wetlands. Works better with smaller flow volumes. Base contains gravel or soil in which the water flows through horizontally at and below the root zone. No open water on the surface, therefore there is less opportunity for waterborne pathogens to develop. More effective than FWS in colder climates. Vegetation normally planted to improve remediation at the rhizosphere are emergent macrophytes. One downfall of HSSF wetlands is media clogging. Figure 3. Vertical flow wetland (Kadlec & Wallace, 2009). Vertical flow wetlands (Fig. 3) use gravity to drain influent waters through layers of varying sized gravel and soil textures, improving water quality similarly to FWS wetlands. Effective at managing pulsing events. Can provide oxygen to support redox reactions and other metabolic processes for influent remediation. Can be used complementary to other forms of constructed wetlands. A more recently developed technology uses emergent plants established hydroponically in ponds, lakes, and FWS wetlands. These floating treatment wetlands (FTW) have several different designs (Fig. 4), including some floating mat in which plants can be attached, with roots extending into the water column. Floating mats can be made from PVC, stabilized horizontally by cabling, and have a depth of at least 1 m to prevent root attachment below. Can tolerate varying water depths. Used to remediate water from stormwater treatment or even acid mine drainage. Effectiveness is improved when FTW rhizome and roots multiply and provide surfaces for biofilms to form, trap and filter sediment. Rhizome and roots produce exudates that break down contaminants. Emergent macrophytes used in the mats can uptake metals, nutrients, and contaminants. Depending on what is removed from the water, harvesting the plants may be necessary every year. Increasing the hydraulic retention time increases remediation performance. Wetlands (Fig. 5) benefit the environment by providing refuges for a rich variety of species in addition to being pleasant to view. They do not disrupt the hydrology of surrounding areas the way urban greywater catchments do. These wetlands are effective at remediating organics, reducing nutrient loads, settling larger sediment which clarifies the water and absorbs and sequesters other harmful contaminants. Limitations of some wetlands may include difficulty in reducing the temperature of water and reducing the very fine sediment in influent and some dissolved contaminants. Regardless, these structures demonstrate between a 41% and 93% reduction in total suspended sediments. Contaminants are often bound to these sediments, and therefore become sequestered and less available as a pollutant. Floating treatment wetlands have even been shown to reduce heavy metal content such as zinc and copper solids from road runoff. Barboza, N., Bedard, M., & Jensen, R. (2006). The Study of Impervious versus Pervious Surfaces, and Low Impact Development (LID) Designs Within the City of Trinidad. Headley, T. R., & Tanner, C. C. (2008). Floating treatment wetlands: an innovative option for stormwater quality applications. 11th International Conference on Wetland Systems for Water Pollution Control. Winston, R. J., Hunt, W. F., Kennedy, S. G., Merriman, L. S., Chandler, J., & Brown, D. (2013). Evaluation of floating treatment wetlands as retrofits to existing stormwater retention ponds. Ecological Engineering, 54, 254-265. MLA (Modern Language Association) "Treatment Wetlands." 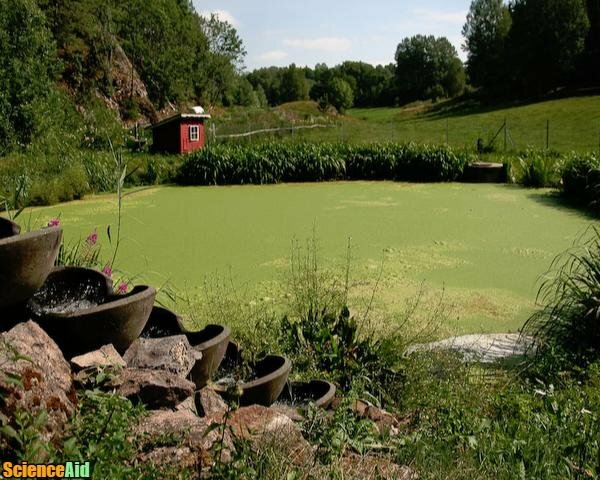 ScienceAid, scienceaid.net/treatment_wetlands Accessed 20 Apr 2019. Chicago / Turabian ScienceAid.net. "Treatment Wetlands." Accessed Apr 20, 2019. https://scienceaid.net/treatment_wetlands. Thanks to all authors for creating a page that has been read 106 times.